You can add a location for your new client right when when you're adding them into the client database on the Clients page, but you can also always add more locations for them later. 1. Go to 'Locations' in your toolbar and click on 'Add Location' in the upper right corner. This will take you to the page where you can fill in details about the new location. 2. Choose a client from the ones you have already inserted into the system. Start typing in the name of the company in the 'Client' slot and it should automatically offer you the option of the company you are searching for. 3. 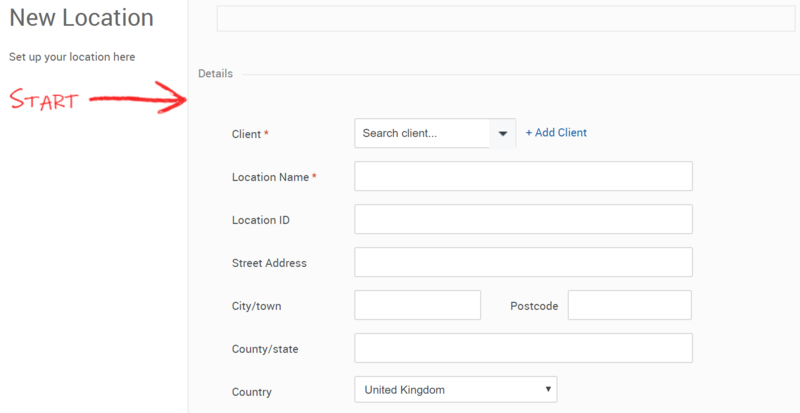 After you have chosen a client from the database, fill in the site name, address, city, country and department for the site. Click 'Save and next'. You have now have successfully created a new location for your client and it should show up in your Locations list. Please note! After the location has been created you can also attach it to other clients as well if you have more than one client using the location. Now that you know how to add sites, you can move on to the next article.